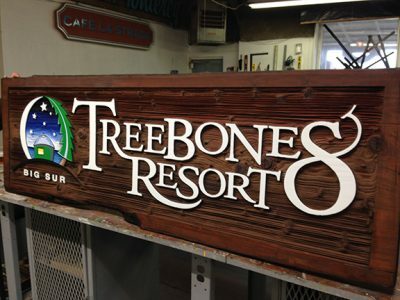 A custom sign will make your business stand apart and reinforce your brand identity. Wood signs are a favorite because they give a down-to-earth feel and that is what California is known for and what tourists come to experience. Sandblasting a wooden sign creates a look that fits perfectly at the beach or under the bright sun of California. At Signs by Van, we keep an eye on the quality of our method by doing all our sandblasting in-house. Sandblasting is an art in itself, and has been a signage tradition for over 30 years. A style of choice in the West Coast, sandblasting is used to achieve dimension in a way that will not tax your budget. Sandblasting wood entails bringing out the details of the wood grain, revealing its character. The same process gives HDU foam that stucco texture that is so popular among our customers. Doing our sandblasting in-house helps us comply with state requirements for environmental awareness. We use Tier 4 engine with our brand new 240 CFM compressor. We are staffed by experienced sign makers who have made signs for all types of businesses, effectively capturing the spirit of the business to bring in customers. Come see for yourself all the possible creative works that Signs by Van can do for your business.